This course examines interrelationships within and between Canada's natural and human systems and how these systems interconnect with those in other parts of the world. Students will explore environmental, economic, and social geographic issues relating to topics such as transportation options, energy choices, and urban development. Students will apply the concepts of geographic thinking and the geographic inquiry process, including spatial technologies, to investigate various geographic issues and to develop possible approaches for making Canada a more sustainable place in which to live. This unit offers an introduction to the types of tools geographers use and how those tools are utilized in the study of geography. Various steps of the inquiry process are explored in detail. The inquiry process is used throughout the unit to answer questions and explore the types of issues geographers seek to address. This unit explores the different geographic regions of Canada. The content offers in-depth descriptions of the landforms and climate regions in Canada and explains how these different regions were formed. The unit discusses how different regions influence the cultural and economic activities Canadians practice today. It also explores how interactions between Canadians and the environment are producing new challenges at home and abroad. This unit examines the connections between Canada's geographic make-up, its resources, and their influences on industry and the economy. The content explores what might be the future of Canada's economy and how the country can sustainably manage its resources. It reviews the different economic sectors before investigating their importance to the Canadian economy and how they are influenced by trade between Canada and other countries. This unit introduces the topic of demography. It examines the population of Canada and the impact that a changing population has on Canada and the rest of the world. The unit offers investigations into population trends, migration, immigration, ageing populations, and urbanization. All topics are explored in relation to how they influence the balance of economic and social demands. 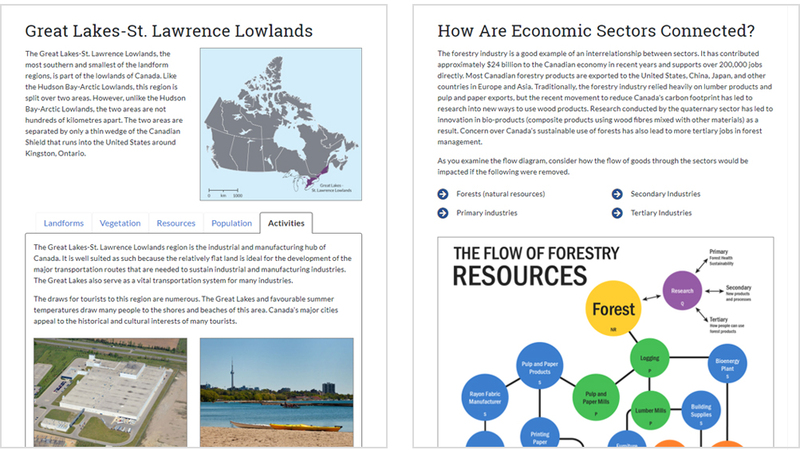 This unit explores the unique challenges posed by Canadian land use and development. It identifies various factors that influence land use and explains how they affect land use patterns. Topics such as urban growth, sustainability, and the management of developing communities are examined according to various case studies. Energy, transportation, and Canadian food systems are all studied in relation to sustainable, cost-effective growth and management. The final project allows students to choose from a variety of different topics or issues to explore. Students will use the geographic inquiry process to generate an inquiry question that will guide their research. They will make use of a variety of geographic skills, concepts, terms, and content to help address their inquiry question. They will communicate their research findings in a written report. There is a proctored final exam worth 15% of the final grade. being responsible stewards of the Earth by developing an appreciation and respect for both natural and human environments and communities.